Merle Haggard left behind one of the most accomplished legacies in the history of country music when he passed away on April 6th. And he also left behind a treasure trove of recordings that have yet to be heard by the public. According to Merle himself, some 300-400 unreleased songs remain in an archive. But only one of those songs can be the final one he ever wrote and recorded. As Merle was suffering from complications due to a double pneumonia and was in a hospital recovering, he would pen what would become his final song, “Kern River Blues.” Even though Merle was barely strong enough to sing, he put out the effort to record the song at his “Hag” studio with his full band. The song is being released on Thursday (5/11) after first premiering on SiriusXM’s Willie’s Roadhouse channel 59 at 4 p.m. Central. “Kern River Blues” is about Merle’s memories of leaving Bakersfield, CA in the 70’s The Kern River is the primary landmark that runs through town. It was recorded on February 9th, 2016, and features Merle’s son Ben on electric guitar. 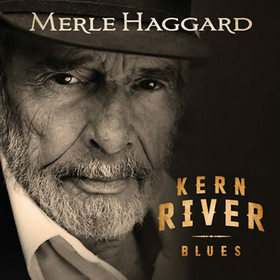 “Kern River” is also the name of another famous Merle Haggard song from 1985 that became a Top 10 country hit. The song will be available at some point on merehaggard.com and on iTunes. 10% of the sales from “Kern River Blues” will go to homeless charities. I’m singing this to the tune of “Honky-Tonk Night Time Man” until I hear it. Huh, my avatar didn’t work. How do you make an avatar? One of the last of a dying breed… The real deal. Just heard it on xm radio, very moving. As a kid who grew up floating in inner tubes down the Kern River, this song brings back many memories. Next to Buck, Merle was an icon in Bakersfield. Appropriate last song. Just bought this. What a gift. Wow! Just reading the lyrics has an impact. Grew up on his music and enjoy all the great country music artists still today!